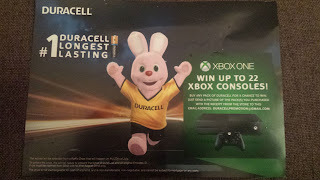 Duracell batteries in middle east is currently running a contest where 22 winners will be rewarded with XBOX One Consoles. The winner will be selected from a raffle draw that will happen on 20th July 2016. Prize must be claimed from 22nd July to 31st August 2016 by presenting Emirates National ID. So why are you waiting, rush to your nearest store to buy Duracell battery pack and participate in the contest. Here is the leaflet of the promotion.